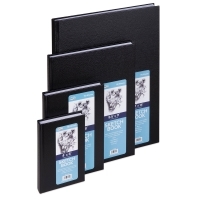 Open the elegantly embossed black covers of these sturdy hardbound sketchbooks, and you'll find a perfect place to preserve your ideas with pencil, pen-and-ink, or watercolor. 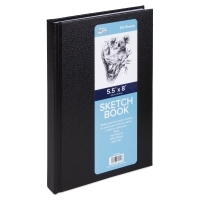 Each sketchbook has 220 pages (110 sheets) of acid free 65 lb white sketch paper. 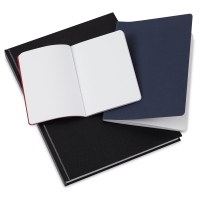 With one of these sketchbooks, you'll always have room to let your ideas grow while you're on the go. 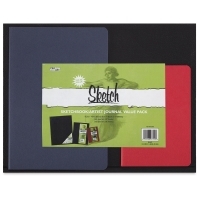 Sketchbook Value Pack, Set of 3 — A great value, just what you need for back to school — or back to the studio! The Pro Art Sketchbook Value Pack includes an 8½" × 11" hardbound sketchbook (110 sheets), a 4" × 6" journal (30 sheets), and a 5" × 8" journal (30 sheets), all 65 lb weight.